After judging nearly a thousand entries for recent writing contests, I’m reminded once again of the importance and power of effective opening hooks. Start out swinging, and readers can’t wait to read more. 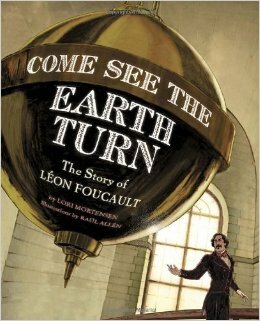 Meander around and readers will quickly lose interest. The truth is, authors have mere seconds to capture an editor’s heart. So what makes an effective opening hook? Start with originality. As I read hundreds of manuscripts, I was amazed at the number of people who wrote about nature’s beauty, but barely skimmed the surface by settling on general ideas about flowers, trees, mountains, rivers, etc. Nature can be a grand subject, but to rise above the piles of other manuscripts out there, your voice and unique point of view needs to shine from the beginning. So dig deeper and look inside. What unique conclusions have you drawn about something that could be shaped into an original theme? If you want to capture an editor’s heart, don’t send them macaroni and cheese. Send them Banana Foster Flambé. 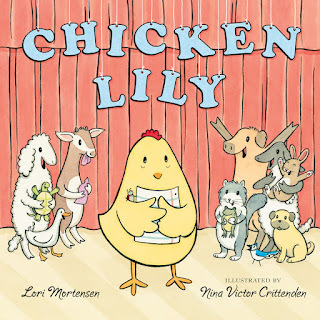 My upcoming picture book Chicken Lily, illustrated by Nina Victor Crittenden (Henry Holt 2016) is a good example of a story with an effective opening hook. Instead of opening the story with any old chicken that lived on a farm, I created a unique character with distinctive characteristics. Chicken Lily was a lot of things . . .
She never made a peep. But Lily was also something else . . .
Because the opening is fresh, focused, and unique, readers want to keep reading to find out more. In this instance, Chicken Lily is . . . chicken! Raise her hand in class? Forget it! Eat something new for lunch? No way! 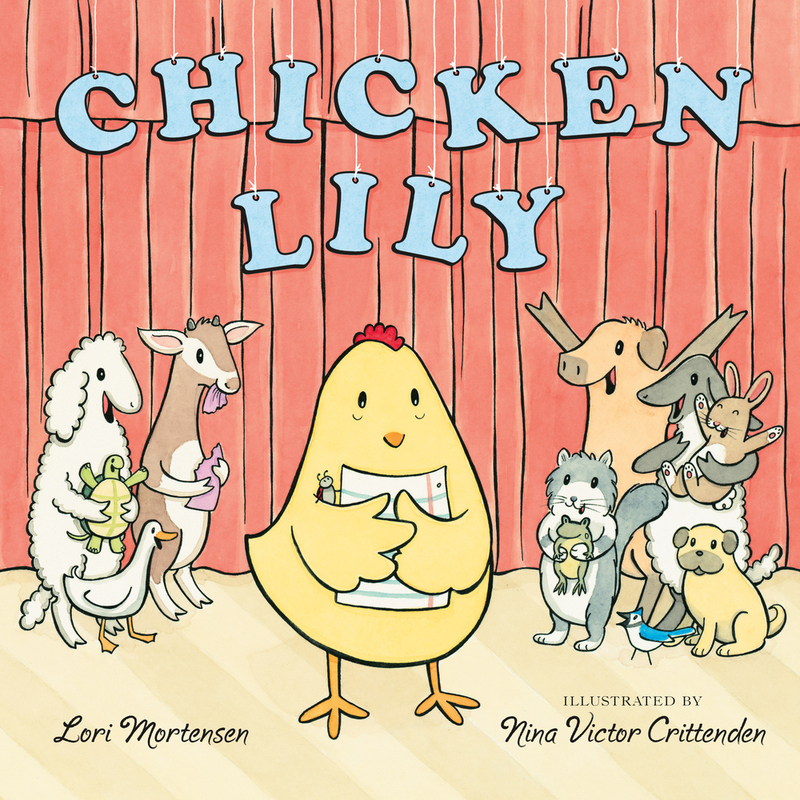 Chicken Lily is a fun, unique character in the barnyard of children’s literature. Next, tighten your story so it fits together like a puzzle. This is especially important for the opening hook. Authors that settle for easy, obvious rhymes, or use multiple paragraphs to say what they could have said in one paragraph, will quickly lose readers’ interest. Let your drafts run wild, but when you’re ready to submit, your opening hook should reflect a fresh and focused manuscript. 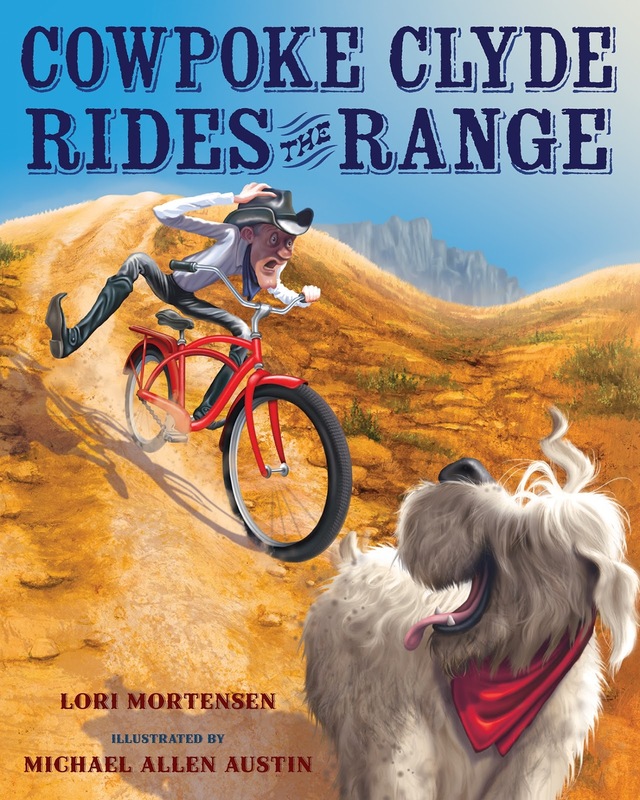 My upcoming picture book, Cowpoke Clyde Rides the Range, illustrated by Michael Allen Austin (Clarion, 2016) is a good example of a strong, rhyming opening hook. Cowpoke Clyde poked at an ad. “Looky, Dawg, at this here fad. In four short lines, the reader meets a unique character, Clyde, a cowpoke who is going to learn to ride a newfangled bicycle. Each line makes sense, each word has a reason to be there, and the rhyme reads effortlessly. So if you’re scratching your head over a manuscript, take a look at your opening hook. Does it make you want to keep reading or, wonder what’s in the fridge? Hmm . . . macaroni and cheese? Or Banana Foster Flambé? Lori Mortensen is an award-winning children’s book author of more than 70 books and over 350 stories and articles. 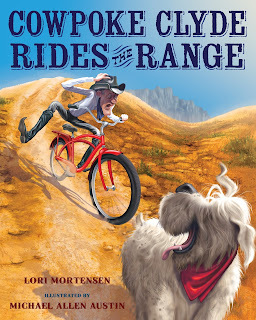 Upcoming titles include Mousequerade Ball, illustrated by Betsy Lewin (Bloomsbury) and Cowpoke Clyde Rides the Range, a sequel to Cowpoke Clyde & Dirty Dawg, one of Amazon’s best picture books of 2013. Other titles include Cindy Moo, illustrated by Jeff Mack (HarperCollins), Come See the Earth Turn – The Story of Léon Foucault, illustrated by Raúl Allén (Random House), a Smithsonian Notable Book for Children, 2010, and In the Trees Honey Bees! 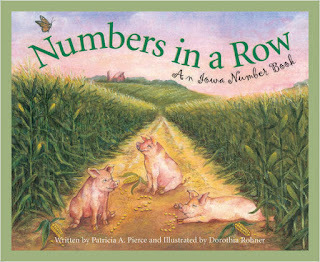 illustrated by Cris Arbo (Dawn), a 2010 NSTA/CBC Outstanding Science Book K-12 Winner. When she’s not removing her cat from her keyboard, she follows her literary nose wherever it leads and works on all sorts of projects that delight her writing soul. 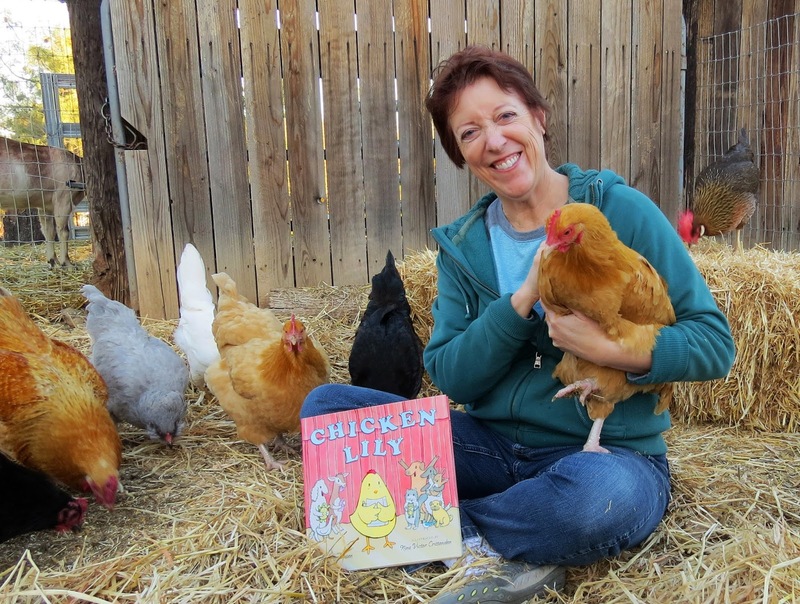 Lori lives with her family in Northern California. Welcome, Alan Cumyn! What was your initial inspiration for Hot Pterodactyl Boyfriend (Atheneum, 2016)? There’s a short answer and a long one. The short: in January 2012, popular YA author Libba Bray gave a speech to over a hundred writers at Vermont College of Fine Arts in which she brought us through the ups and downs of her writing career. 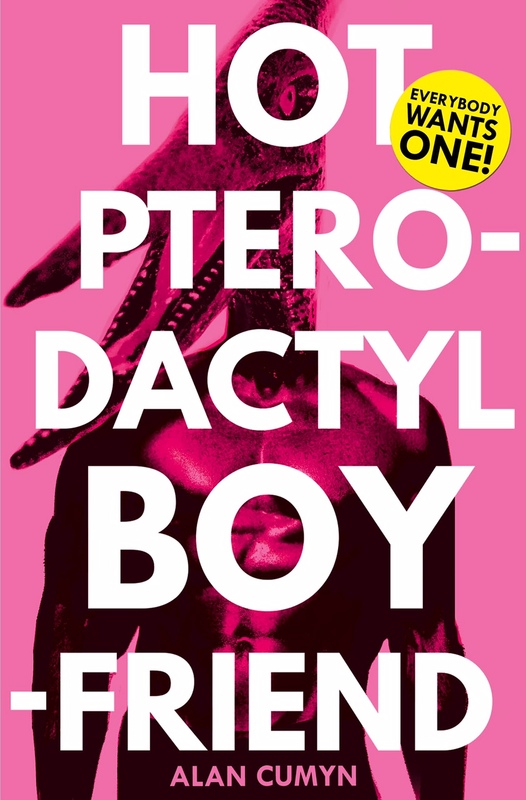 Three times in the course of an hour she said, “Don’t go writing your hot pterodactyl boyfriend novel.” She meant that we shouldn’t slavishly follow the trends. But I was struck by the phrase. When I approached her afterwards and said that I was getting an idea, she encouraged me to follow up, and a little later the whole first chapter, in which the pterodactyl, Pyke, arrives at Vista View High in a calamitous fashion – by landing unceremoniously on the cross-country running champion, Jocelyne Legault – more or less fell out on the page for me. The longer answer takes me back more than ten years when I was riding a train from Toronto to Ottawa. I had been at some publishing event or other, and was full of the possibility of new stories. The train rounded a bend and Lake Ontario came into sight. On a rock by the shore a great blue heron, which looked like an ancient creature, pierced me with his gaze. It was the oddest feeling – I felt locked in direct communication with an intelligence not only from another species, but from a vastly different time. Seconds later the landscape changed, the heron was gone, but I pulled out my pad and scribbled furiously for several pages about a heron who is able to change into a man at will, and who wanders into the big city from time to time almost as a vacation from his usual existence. After a time I stopped writing because I realized I didn’t know enough about herons to proceed. Over the years, I worked on several versions of this story, and got sidetracked with an interest in Kafka, whose "The Metamorphosis" (1915) famously envisioned a man who wakes up one morning transformed into a bug. 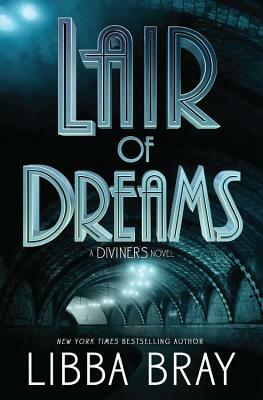 I was drawn to the idea of introducing something startlingly unreal and fantastical, but continuing the rest of the story in as realistic a fashion as possible. I was also, like so many others, attracted by the dreamlike nature of Kafka’s writing. The story morphed and became at least two entirely different novel-length manuscripts that sputtered for various reasons and never quite worked. 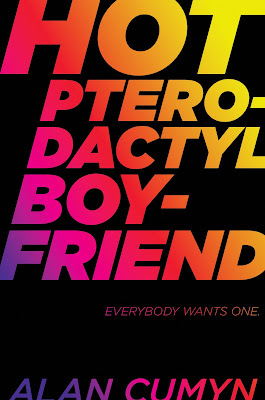 And then: “Don’t go writing your hot pterodactyl boyfriend novel.” I was seized with yet another possibility to work with some of the same ideas and influences, and perhaps not take it so seriously this time. That first chapter poured out of me within a day or two of hearing Libba Bray speak in January 2012. I sent a full draft to my agent, Ellen Levine, in late December 2013, so it took me about two years to write much of the manuscript. During most of that time I told nobody what I was working on. I like the freedom to go wherever I want on the page and to fail privately in ridiculous ways if need be. After that strong opening chapter fell out, I slowly went over that material again and again for clues about how the story must proceed with these characters in the situation they find themselves in. Before showing the draft to Ellen, of course, I got feedback from my wife Suzanne, and from friends and family, and made it as strong as I could. Ellen contacted me enthusiastically in February 2014 and I worked on some more revisions for her. 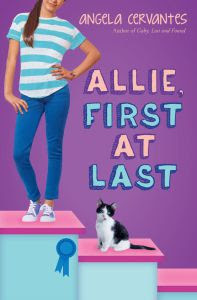 She sent it out to publishers in March and, although a lot of editors passed on it, we did get offers in April, with Caitlyn Dlouhy at Atheneum winning out. I got a chance to meet Caitlyn in New York in July 2014, and U.K. editors in September. When I was in New York I also spent time at the Museum of Natural History which just happened to be showing a major exhibit on pterodactyls! Some of the latest research changed the way I thought about the physicality of Pyke, and made it into the book. A lot of the revisions for Caitlyn involved strengthening middle parts of the story and ending it in a way that stayed true to the characters, and to the strangeness of the whole telling. Again – I kept going back to the beginning for inspiration. The manuscript was pretty well finalized by April 2015, and I was reviewing galleys in October. There wasn’t a major crisis or anything, no pitched battles, but Caitlyn and I did have strong discussions about all the characters and themes. I take it for granted that my creations will feel real to me, but it’s lovely when an editor so fully immerses herself as well. What were the challenges (literary, research, emotional, logistical) in bringing the story to life? Nothing about this story was straightforward. 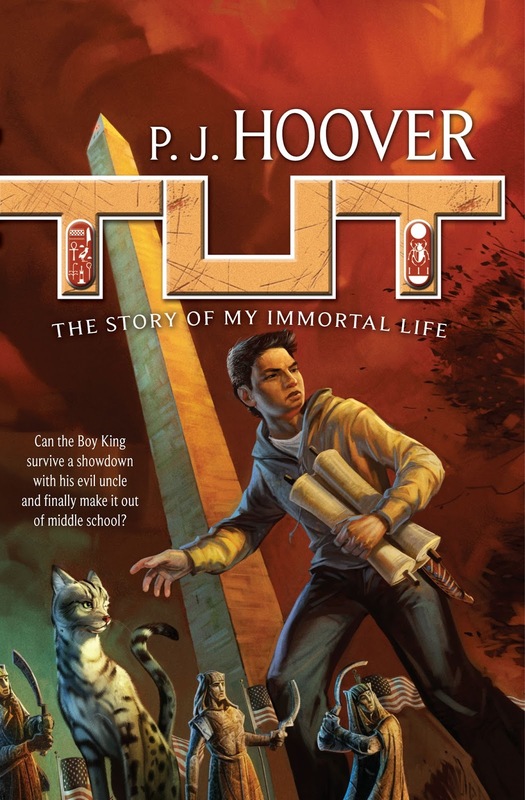 On the opening page, Pyke appears as a speck in the sky, and by the end of that chapter he is the first inter-species transfer student in the history of Vista View High. The initial challenge – how do the students accept him as anything but a monster come to eat the school? – I skirted in my first draft by summarizing the changes in a paragraph or two. It was only fairly late in revision that I realized I needed to show in scene those crucial minutes after Pyke has landed on Jocelyne and then carried her to the school nurse for attention. Pyke is not the main character, of course – the story actually belongs to the student body chair, Shiels Krane, an A-type leader whose well-ordered plans for her graduation year have nothing to do with dealing with a pterodactyl who steals everyone’s heart, including her own. In that way I was able to shift the question about believability – if Shiels buys into it, then it’s easier for the reader to believe, too. 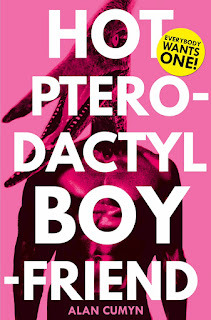 I did do a lot of background reading on pterodactyls, but in my mind I was treating Pyke as the ultimate bad-boy boyfriend, and that’s part of the fun of the story, watching characters adapt to a ridiculous situation that turns normal and then actually seems familiar. We do it all the time in real life, just not with pterodactyls! So often writing fiction convincingly is a matter of taking care of the tiny details, making those seem lifelike, so that the huge lies one tells hardly stand out at all. What made you commit to the writing life? What did you sacrifice for it? I was very lucky to attend a graduate writing program when I was young, only 24, at the University of Windsor, where my mentor, Alistair MacLeod, happened to be a brilliant writer and terrific teacher. Without that early formation, I’m not sure I would’ve stuck with it, given all the difficulties I had initially in publishing anything at all. It took me seven years of strong effort after graduation to get a single short story accepted in a literary journal (for which I was paid $50). My first three novel manuscripts were rejected before the fourth was accepted, and even that one sat in the publisher’s office for over a year before I got a yes. Along the way I decided I was not going to be the sort of writer who lives in a tiny room in the YMCA, turning his back on life so that he might have time to write. I have worked at a number of full-time jobs that, fortunately, also fed my sense of life and society, and so nurtured my writing as well. But if I hadn’t married and had children, I doubt I would have written for younger audiences. I faced a really tough decision at around age 40 when the excellent government job I had (as a writer and researcher on international human rights for the Immigration and Refugee Board of Canada) seemed to be too much to handle on top of novel writing as well. Some of my adult novels were suddenly doing well, and I had to make a choice. It was a big gulp – our children were young, Suzanne had just started a doctorate program, and there was no extra money in case things went badly. So with family support I sacrificed the security of a regular paycheck, but was fortunate enough to have waited until my art was strong enough to withstand the pressures of such a decision. It was the right thing to do, and I haven’t really looked back, especially since part-time teaching at the Vermont College of Fine Arts allows me to use my skills, and helps keep the wolf from the door during the inevitable down times in a writing and publishing life. What about the business of publishing do you wish you could change? I would love it if editors were not so extraordinarily busy, if they could somehow always keep a sense of the leisure of reading while opening up a new manuscript. Editors often have crushing workloads and it means “quiet” stories often don’t have a chance to get their attention, they’ve got too many submissions to wade through before going back to their email backlog etc. I know, it’ll never happen, and the really good editors do find ways to let themselves fall into a story when they read, no matter what their to-do list looks like. But I do think a lot of fine writing is overlooked because of the craziness of today’s schedules. 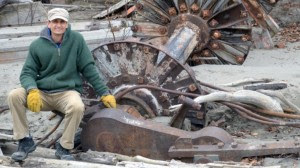 Alan is the faculty chair of the MFA program in Writing for Children and Young Adults at Vermont College of Fine Arts. See also Video Interview with Alan Cumyn from Indigo Teeen. 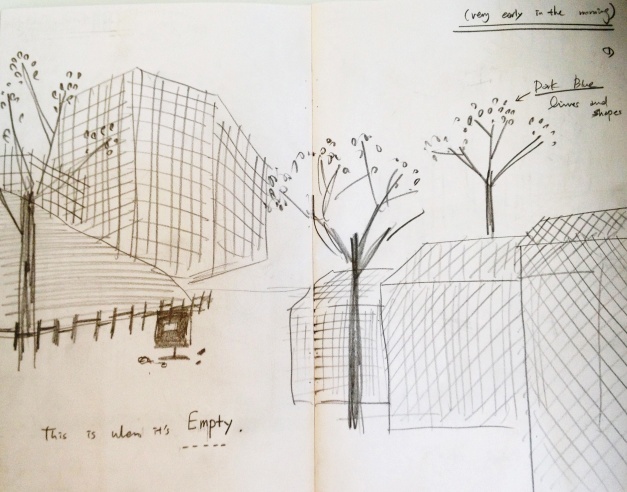 From an early age, Dorothia Rohner knew she was an artist. Inheriting her artistic parent's fascination with art and nature, she was encouraged to pursue and refine her skills. She studied technical illustration, fine art, art history and graphic design. Eventually, she earned her degree in Biological Pre-medical Illustration from Iowa State University—a curriculum that allowed her to combine her love of illustration and science. As an artist, she has worked in various fields: scientific illustration, animation, graphic design, nature painting, licensing and gift design. 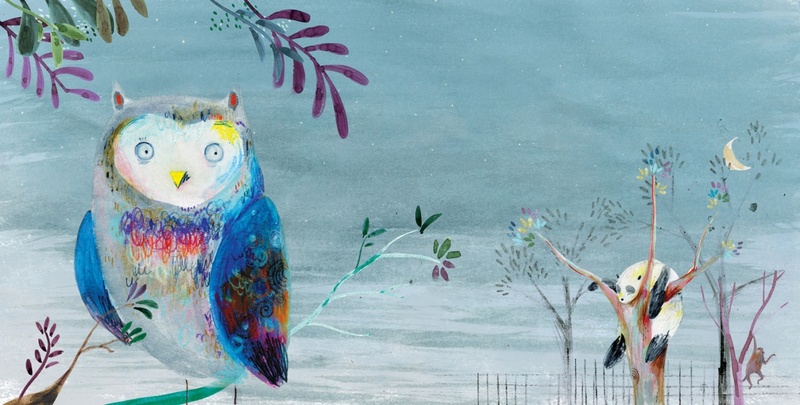 She now works from her studio, surrounded by woods, overlooking a small pond where she writes and illustrates stories for children; inspired by nature, imagination and a tad bit of humor. She also enjoys creating pop-up and moveable books. Her illustrated children’s books include: Numbers in a Row, An Iowa Number Book (Sleeping Bear Press) and Effie's Image (Prairieland Press). Her work for children has also been published in Cricket Magazine. 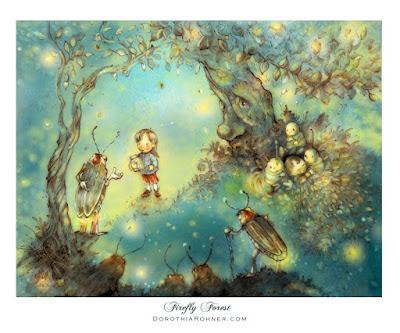 Her illustration, Firefly Forest, was the Grand Prize Winner at 2014 SCBWI Bologna Illustrator Gallery, Bologna Children’s Book Fair. That same year, she was selected for the 2014 SCBWI Portfolio Mentorship Award at the SCBWI Summer Conference. Her portfolio was one of six chosen out of two-hundred. Follow Dorthia: Instagram & Twitter: @dorothiar and Facebook. 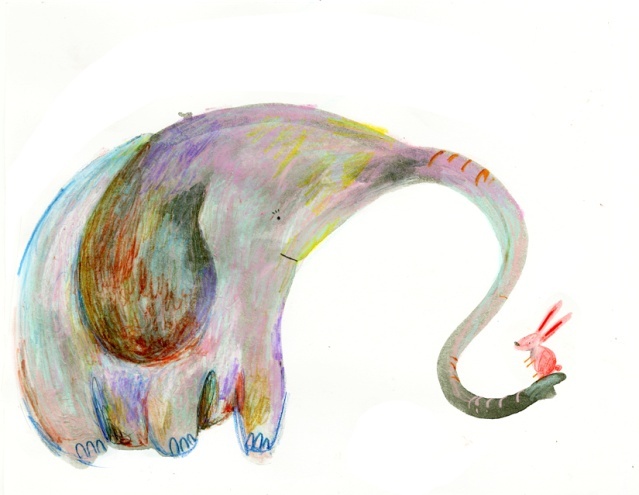 What inspired you to begin creating illustrations for children? When I was small, my mother wrote stories for my six siblings and me. She created believable worlds and illustrations to go with them. They were never published, but I remember how magical an ordinary day became when she shared her stories with us—inviting us into her imaginative worlds. 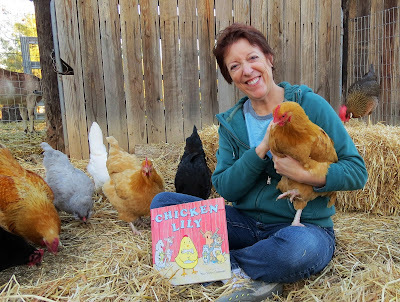 My mother’s influence first inspired me to want to create books for children. Years later, while studying scientific illustration, the class assignment was to make a spread for a children’s book. 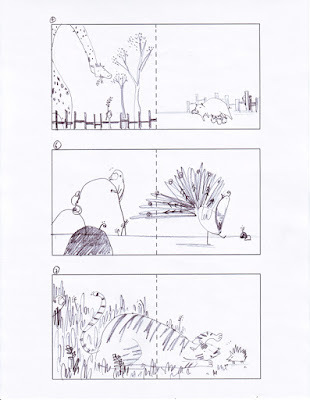 That studio project sparked my childhood memories and rekindled that desire to make books for kids. 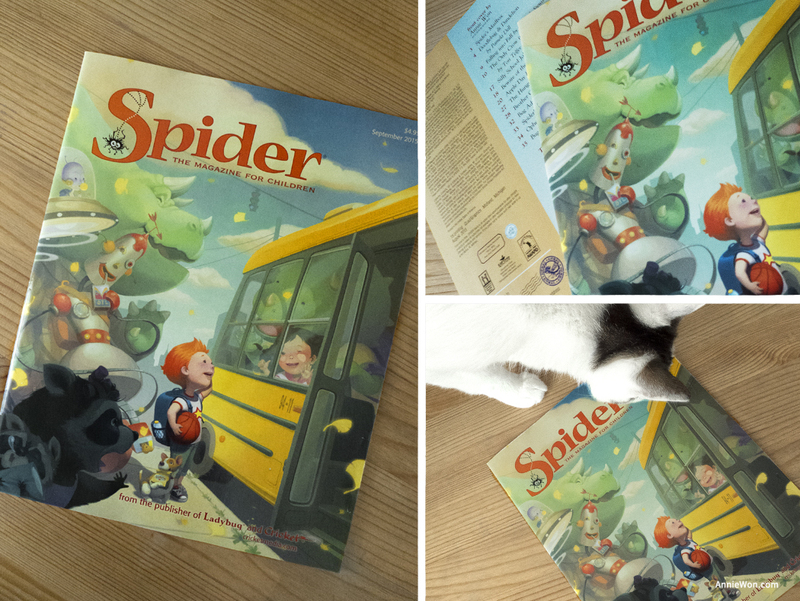 It took a little while, but eventually I illustrated my first children’s book. 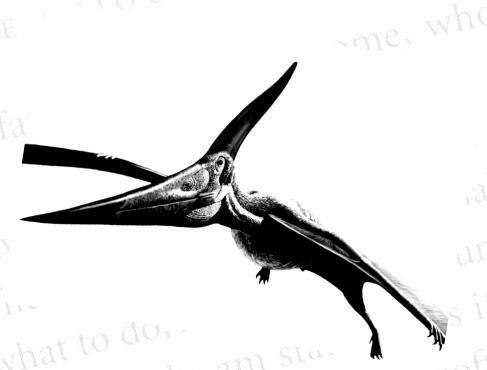 How has your experience with scientific illustration influenced your work for children? Good question! The transition from creating scientific to children’s illustration has been interesting journey for me. Because of my scientific training, I wanted to add every detail into an illustration. 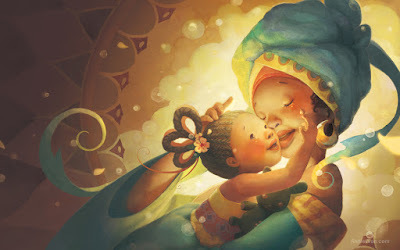 For children’s illustrations, I’ve had to un-learn some of that training in order to leave emotional room for the viewer, exaggerated expressions, emotion and motion. I’m still working on that. My training has influenced me to enjoy drawing animals, plants, birds and insects living in the natural world. 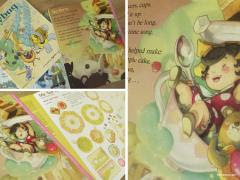 However, with my illustrations for kids, I find it much more fun to add in a few fairies, and other whimsical critters. What was the inspiration for the illustration Firefly Forest, winner of the 2014 SCBWI Bologna Illustrators’ Gallery? I’ve always been fascinated with fireflies because of the magic they bring to summer nights. Years ago, like most children, we used to chase and capture them to fill our jars with light. Inspired by these memories and the forest we now live near, I sketched out the trees that speak only truth, an angry council of fireflies that rule the forest and a little girl carrying a jar full of fireflies, searching for her brother. I intentionally left the narrative open for the viewer to interpret. I created this illustration in two days and I really enjoyed working on it. However, I almost didn’t enter the BIG contest because I thought it was too odd of an illustration. However, I ended up sending it anyway. I’m glad I did. With the input of my agent, Laura Biagi, I am revising a manuscript that is almost ready for submission. Yay! 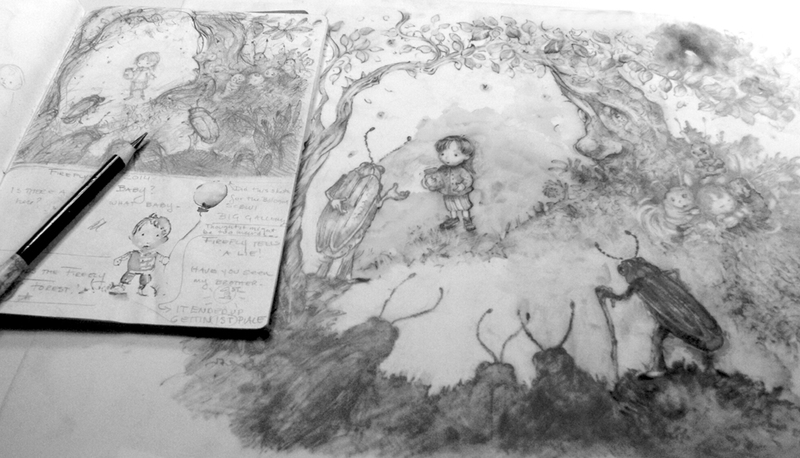 I’m finishing up the character sketches and illustrations that will accompany this story. 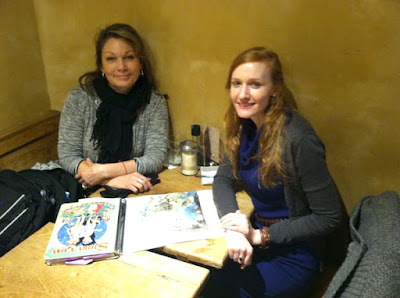 While I was in New York at the winter SCBWI conference, I was able to meet with Laura to discuss my other projects. She asked about the story behind Firefly Forest, so I am brainstorming and diving into that next. I also received helpful input from an art director in New York on a novelty fairy book, so I will be revising that too. I also have a sketchbook filled with ideas that could be potential stories. What advice would you offer illustrators who are just starting out in the field of children’s literature? The advice I try to remember is patience, practice and perseverance. 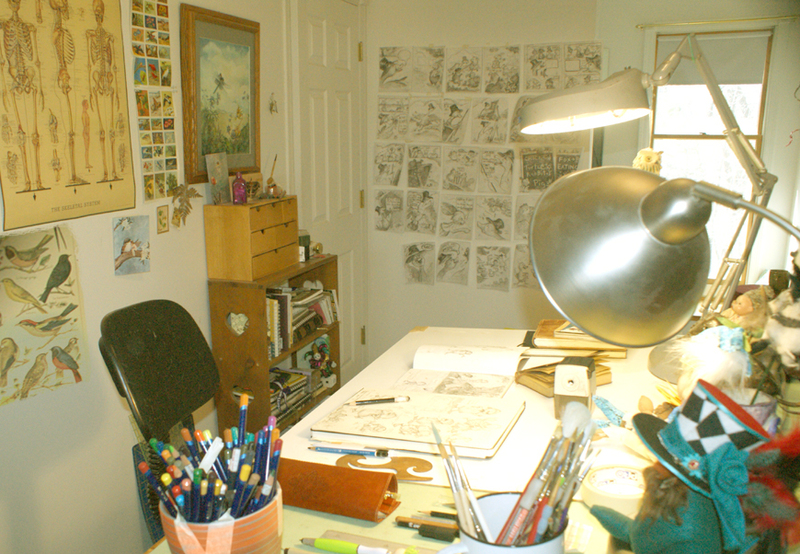 It’s hasn’t been that long since I began focusing on making books for children, so I still feel new to this, too. In any field of creating art, I believe it is essential to honor your individuality and create from the inner voice. This helps to quiet the inner critic that so often leads to comparison and competition with other artists. It is important to study other artists work, get involved with online picture book communities, and celebrate other’s successes. 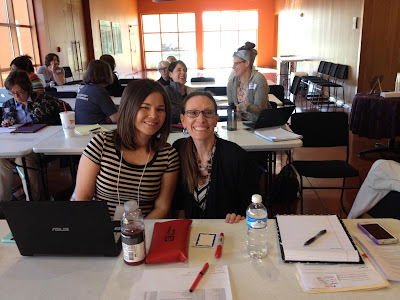 I would suggest joining SCBWI, going to conferences, getting portfolio and manuscript critiques, joining local critique groups and finding like minded people who you can learn from, share with and enjoy the journey. Lastly, read lots and lots of kids books! 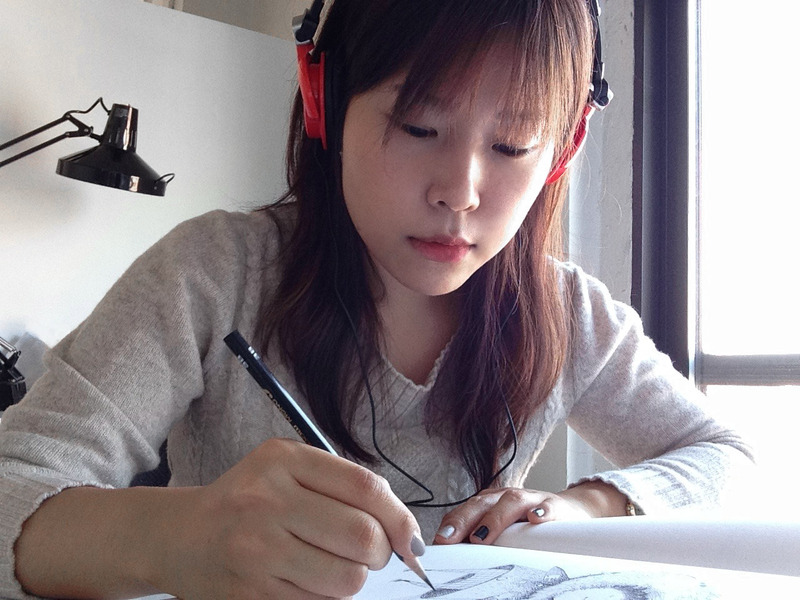 New-York based illustrator Annie Won received her MFA at the School of Visual Arts in New York. Her style is characterized by the use of digital collage, mixed perspective, and a dreamlike quality that speaks to the imagination of children. 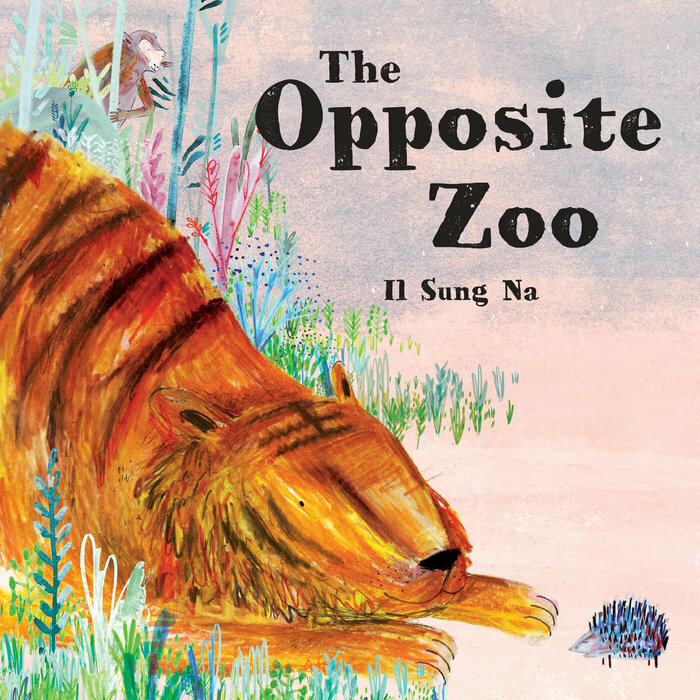 Her illustrations will appear in The Dragon Circus, Tea Party, Picnic in the Snow, and Welcoming Song, ibooks such as The Old Man and The Sea, The Hound of the Baskerville and picture books that will appear in 2017. Congratulations on your illustration The Light being selected as a finalist for SCBWI’s Bologna Illustration Gallery. SCBWI will display The Light at the Bologna Children’s Book Fair. Can you tell us about the inspiration for this illustration? Thank you to SCBWI for selecting my piece. I am so pleased to have such a great opportunity. I hope I can attend the Bologna Children’s Book Fair one day. I can’t say what inspired me exactly. It may have been a sweet lyric of a song, a warm breeze across my face or a touching story from news. What I know is all of those were mixed harmonically and made me to create image of mother and her child. 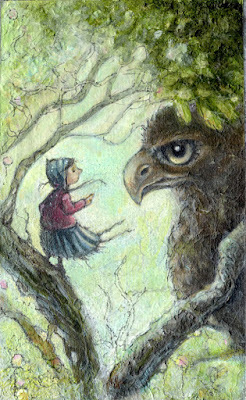 As a children’s book author-illustrator, my illustration is always based on stories. It’s funny that I need a full story even though I draw a simple doodle. And The Light is the peak moment of a story about a Mother who finds her lost child. I can see that emotion in the illustration. When did you begin drawing? I started drawing when I was able to grab something to draw with. My official artistic career started with my first job. I was a computer game concept artist. I drew all kinds of things such as characters, trees, clothes, weapons and more for the game. 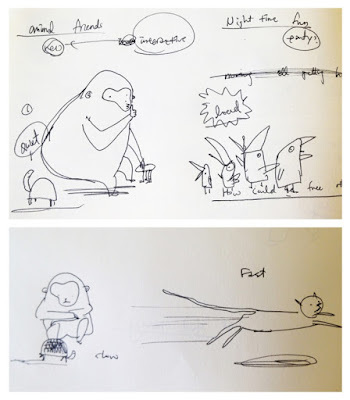 However, after working as a designer about seven years, I decided to do something more meaningful for both people and myself: a children’s book author-illustrator. I studied at School of Visual Art and after graduating the awesome course, now I am working as a freelance illustrator. What led you to children’s book illustration? I love children’s picture books. They are each like a small art gallery with brilliant stories. Also I’m always amazed by how children read stories from a single image. They even find something interesting in my image that I haven’t recognized! You’ve illustrated work for children’s magazines, including the cover for the back to school issue of Spider (September 2015). What do you enjoy most about magazine illustration? I like magazine work because I can try something new for each piece and have to complete those as fine images. I must get successful results right away, since I don’t have much time to start everything again. 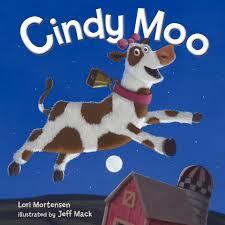 Compare to children’s book assignment, magazine assignments have to be completed on a tighter deadline. Thus it is pretty tough but I love the challenge. And I love my editor Sue, who encourages me to try the new thing. What advice do you have for others who are starting a career as a children’s book illustrator? Do not to give up your dream. 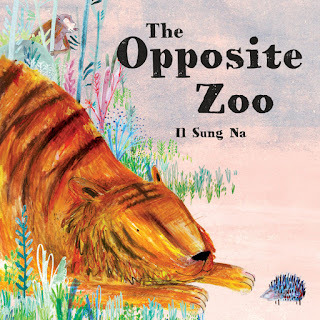 It seemed like I would never get a book assignment until I was offered my first assignment by Little Golden Books. Before that, I tried my best to promote my work and learn from others. 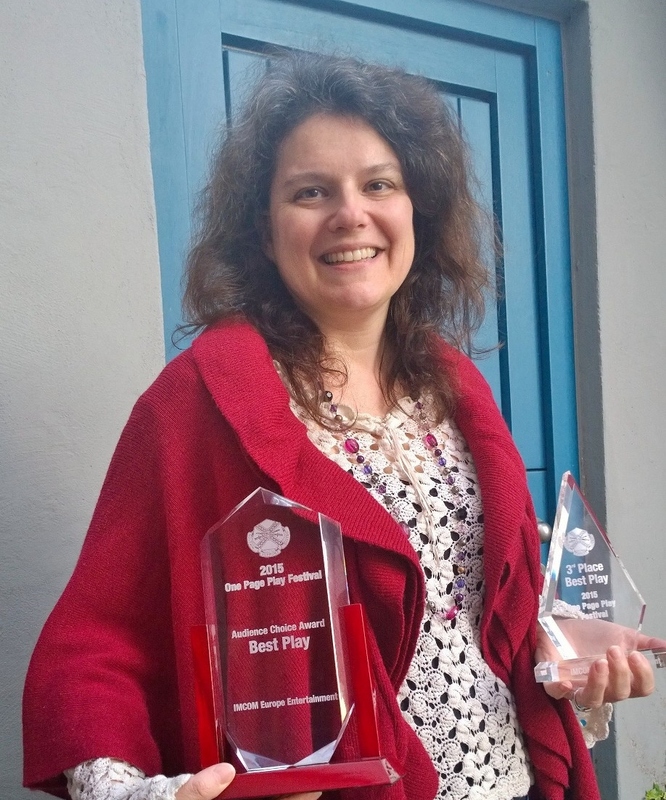 I made more than dozens of picture book dummies, sent bunch of postcards to publishers, presented my portfolio to several publishers, joined SCBWI and attended three conferences, enrolled children’s book boot camps and more. While I was trying those things, nothing was sure and clear except one thing: I believed that my dream would come true if I don’t stop trying. 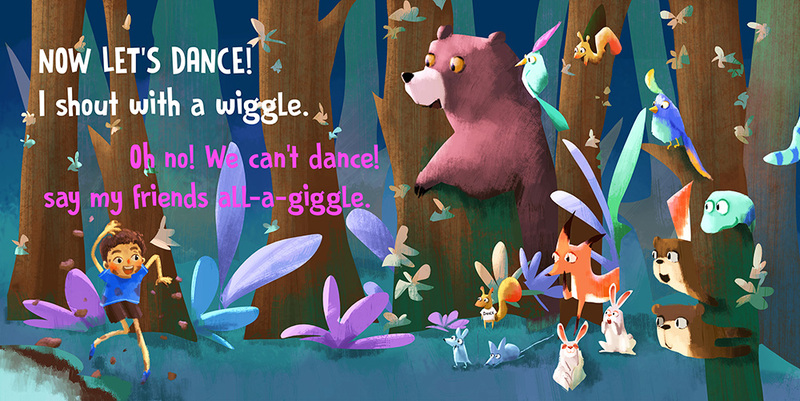 I just completed my first Golden Books illustration assignment. And now, I am working on another magazine piece, cover art for Ladybug magazine. 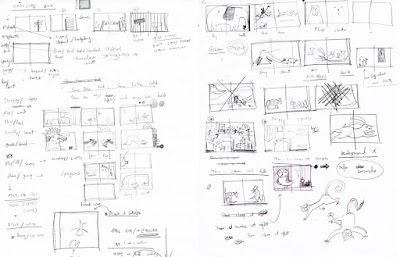 I am also developing my own story for a picture book, too. I am truly happy to start my career as children’s picture book illustrator but I hope I can publish my own story as well. The Matter of Talent by Barbara O'Neal from Writer Unboxed. Peek: "Why does one person dance, another preach, another write novels? Is talent a thing? Where does it come from? How do we know if we have it—or don’t?" See also When You're Writing Mountain Is My Writing Molehill (and Vise Versa) by Jan O'Hara. Piñata Busters and Trailblazers by Angela Cervantes from Latin@s in Kidlit. Peek: "I was inspired to write this book because I grew up in a close-knit, proud, Mexican-American community where we celebrated the accomplishments of people like Ellen Ochoa, the first Hispanic woman to go to space (1993 Discovery mission); Henry Cisneros, the first Mexican-American mayor of San Antonio (Yay, Texas! ); Tom Flores, the first Hispanic NFL head coach to win the Super Bowl (Go Raiders!)" Bologna 2016: Agents Talk Children's and YA Book Trends by Diane Roback from Publishers Weekly. Peek: "On the YA side, I’m seeing a lot of fantasy that feels very accessible to readers who are not dedicated to fantasy. 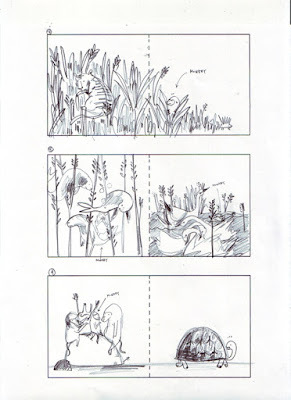 The setting is similar to somewhere on our planet (like China, or Scotland, or Mexico), usually with a female lead." Mind the Gap: Questions about Power for Storytellers by Mitali Perkins from Mitali's Fire Escape. Peek: "I offer these questions as a checklist for fellow authors and illustrators, perhaps as fodder for discussion in critique groups and conferences, or for your private journaling pleasure." See also All That Isn't Said: Islamophobia in YA Lit by Kaye M from Interrogobang. How to Write a Great (and not Schmaltzy) Love Scene by Jessi Rita Hoffman from Jane Friedman. Peek: "There was tension and intensity in old-fashioned courtship, and that is the stuff of which great fiction is made. Your writing teacher called that tension “conflict.” Interesting fiction is built on conflict." 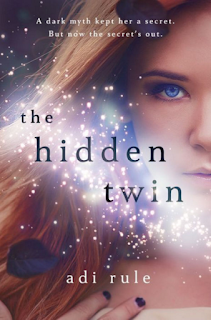 Author Interview: Adi Rule on The Hidden Twin by Robin Herrera from WCYA: The Launch Pad. Peek: "The secret to authenticity is in the mundane, I think. What is the protagonist’s day-to-day like?" See also Author Interview: Deb Caletti on Essential Maps for the Lost by Roger Sutton from The Horn Book. 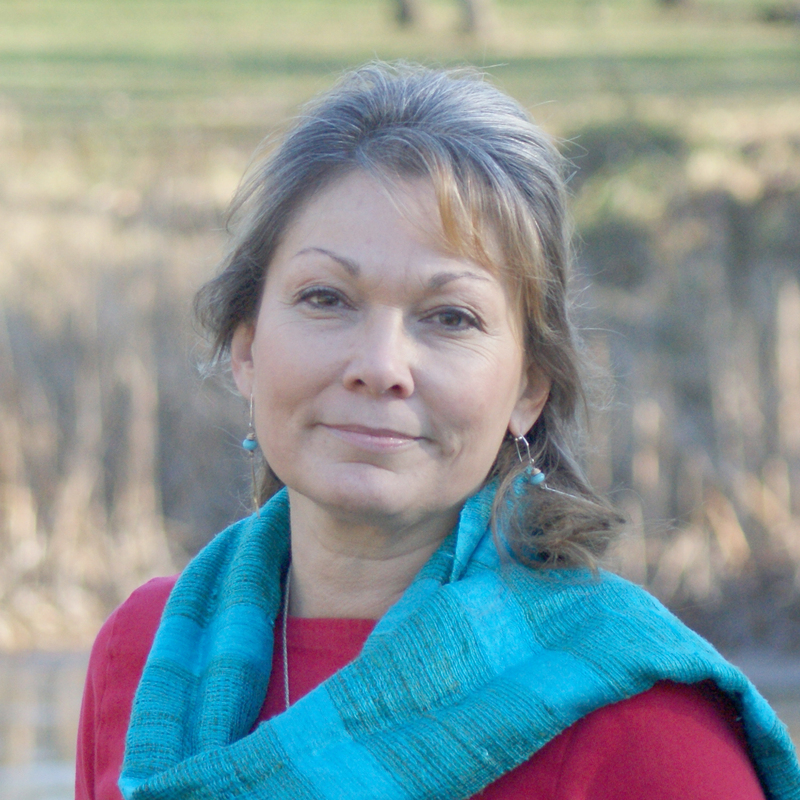 Damaging Perceptions About Alcohol Abuse Among Native Characters in YA Literature by Debbie Reese from American Indians in Children's Literature. Peek: "Doctors assumed he was alcoholic, and that alcohol abuse was the cause of what they saw in tests. He told them he didn't drink, but, they wouldn't probe further. Now, he's finally been diagnosed with a fatal disease." Discussion: Magical Disabilities by Corinne Duyvis, Natasha Razi, Kayla Whaley from Disabilities in Kid Lit. Peek: "I want disabled superheroes. I want lots of disabled superheroes. ... But I don’t want to be able to read the disability and immediately guess the superpower." See also Interview with Corinne Duyvis on Otherbound and The Edge of Gone. The Pros and Cons of Using a Facebook Profile But Not An Official Page from Jane Friedman. Peek: "...a lot of the people I consider friends also work in the industry, but still: I imagine my public posts can be a mix of dull or irrelevant, which means I risk being muted indefinitely by a fair number of friends." Thank you, North Texas SCBWI! Congratulations to the Texas Institute of Letters finalists, including Liz Garton Scanlon, Anne Bustard, Don Tate, Brian Yansky, Pat Mora, Kathi Appelt, and Chris Barton. Ying Hui Tan is a Malaysian Chinese illustrator. 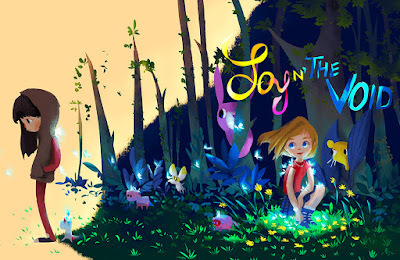 Born in a small town, Teluk Intan, she graduated with a degree in 3D Animation at the University of Hertfordshire and currently living in Reading, U.K. She spent the first few years working as a concept artist for games and cartoon series then she decided to become a children’s book illustrator. She loves storytelling and giving ideas while working with talented people. Her favourite parts of creating her artwork are mixing colours and experimenting different lighting setup for her scenes. Tan’s dream as a children's book illustrator is to spread positive energy, thoughts and happiness to another because she believes everyone is born kindhearted and have a choice to forgive and help another. Tan spent her free time traveling with her husband and camera, eating local food, taking good photographs and meeting local people or just staying at home watching classic old films, listening to oldies and cooking new dishes. Tan loves animals especially whales, dogs, dragon like reptile and dinosaur, she wanted to adopt a dog someday. 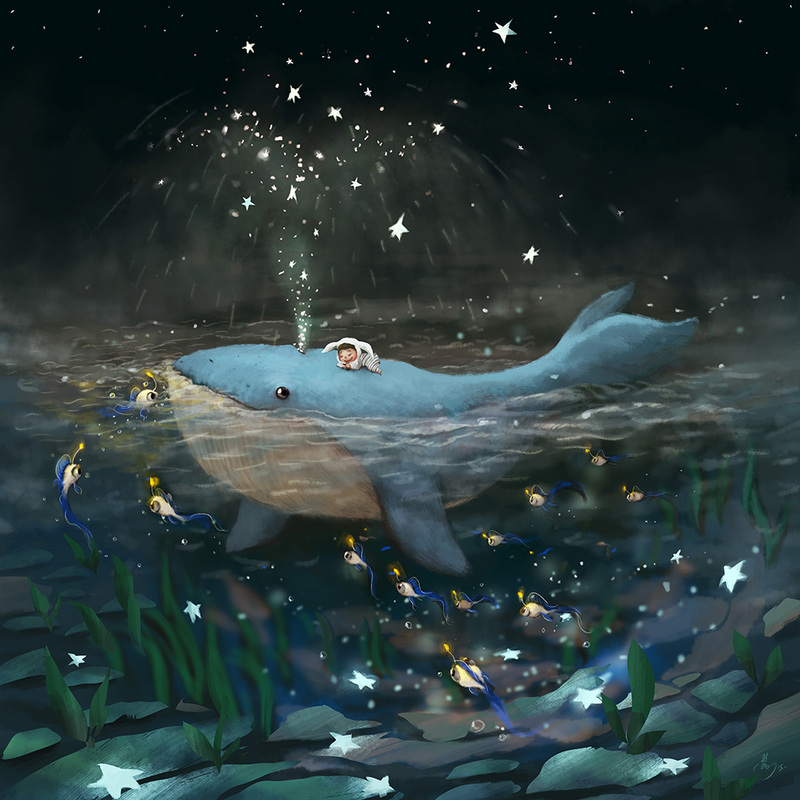 Congratulations on having your illustration Dreamer Whale selected for SCBWI’s Bologna Illustrators’ Gallery. 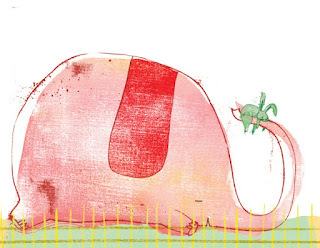 Dreamer Whale will be displayed by SCBWI at the prestigious Bologna Children’s Book Fair. What inspired Dreamer Whale? Thank you, I am thankful for being selected as a finalist and taking part of this interview. I always fond of whales, especially blue whale. They are the biggest living thing yet they are so gentle and elegant, they can sing too! I don't know how to swim but I always imagine myself swimming closely with them just like a kid having a dream. Your career as an artist has included many fascinating achievements from working as a concept artist for games and cartoon series to 3D animation and now children’s books. How do these experiences influence your current projects? 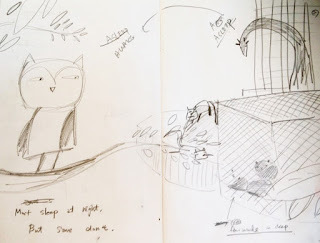 Those experiences help me see my art differently, making a children's book is like building a 3D world for me, everything has to start from scratches and find the connection between them. 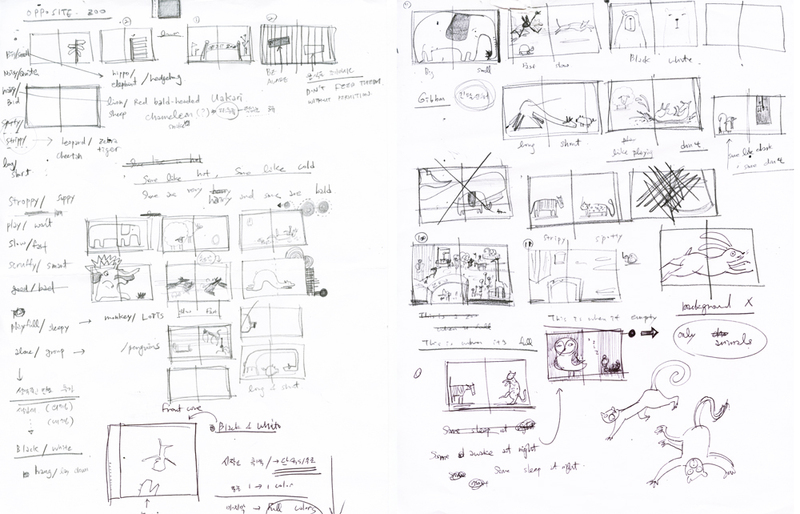 Since I left the games and animation industry, I always start from a story before I creating a character or a scene. I don't like to paint without my soul and feelings, so having a background story really helps me to stay excited of making the scene looking right to tell the story. Being a children's book artist is really fun because I can be a director and photographer at the same time, the biggest challenge is using limited frames to tell a story and make each page / frame counts. As a woman from a small town in Malaysia who now lives and works in Reading, U.K., do these experience inspire your art? I have been living in the U.K. for more than five years without my family and friends. I never felt this loneliness and emptiness before. What I could do to help myself is creating and imagining happy and beautiful things to keep me going. You mention on your website that it was your love for Japanese anime that got you started drawing. Did you first draw your favorite characters? Or did you create your own stories? I drew my favourite characters at first because I didn't know I can draw, then soon I started creating my own stories, it was more fun to create my own. 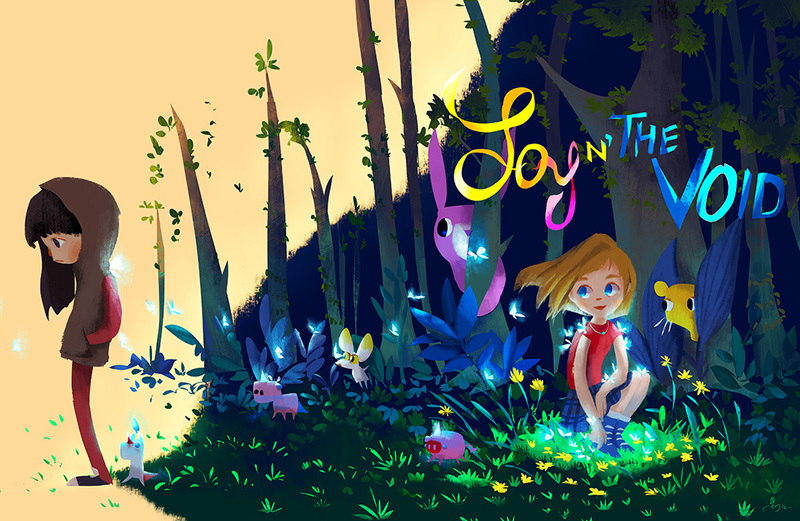 I'm working on a new book called JoyN'TheVoid, a book to help children opening their mind and feelings towards happiness and helping another. What advice do you have for artists just starting out in the field of children’s book illustration? Good things will come eventually after loads of hard work, always have faith in yourself and keep trying!